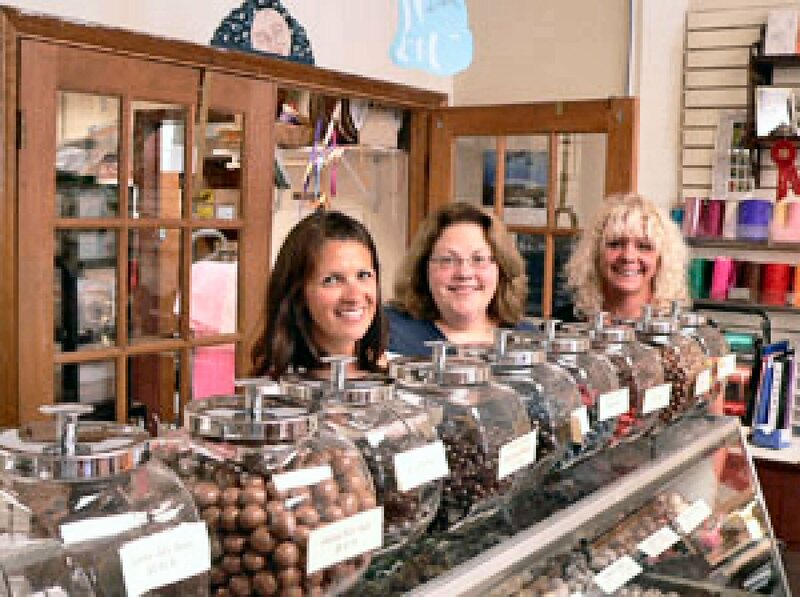 OSWEGO – Man in the Moon Candies in Oswego will sweeten St. Luke’s “Cheers To 40 Years” Wine and Beer Tasting Celebration on October 23 with chocolate truffle samples for all attending. 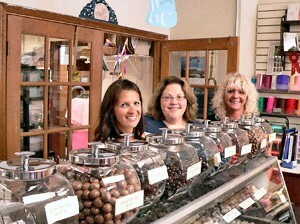 Man in the Moon Candies of Oswego will be providing some sweet samples – delicious chocolate truffles, sure to complement the many wines and beverages that will be available at St. Luke’s Cheers To 40 Years Wine and Beer Tasting Anniversary Celebration. From left are: event organizer Kelley Greene, Man in the Moon Candies owner Amy Stone-Lear, and Stacia Steinbach event organizer. Man in the Moon Candies will join other local businesses sharing tasty seasonal food samples that will complement the many wines or beers available for all to try during the celebration marking the not-for-profit, community-based healthcare provider’s 40th year of serving the greater Oswego County community. The “Cheers to 40 Years” event will feature a number of local wineries and distilleries each providing free samples of their select offerings, food pairings from local establishments and a variety of seasonal beer samplings courtesy of Eagle Beverage. A silent auction with fabulous prize packages, raffles and live music by The Billionaires will add to the excitement. What a great way to enjoy a fall evening in Oswego. The event will take place from 6 to 10 p.m. at the Lake Ontario Event and Conference Center, 26 E. First St.
Tickets are $30 each for adult/general admission and $15 each for designated driver tickets. To purchase tickets, stop at St. Luke Health Services, Bishop’s Commons and St. Francis Commons in Oswego or Michaud Residential Health Services in Fulton. Harbor Pharmacy and Pathfinder Bank are Cheers To 40 Years Celebration Event Sponsors. Proceeds from this event will go to support resident programs at the not-for-profit affiliate organizations comprising The St. Luke Family of Caring; St. Luke Health Services, Bishop’s Commons Enriched Living Residence and St. Francis Commons Assisted Living Residence in Oswego, and Michaud Residential Health Services in Fulton.